Elsewhere is a free meme maker app allowing users to create customized meme clips from pre-selected funny video content. The app is currently on iOS only. App Growth Network’s goal was to increase Elsewhere’s organic downloads in their current markets. Because the Elsewhere’s users are based on iOS only and the app did not have any previous exposure to Apple Search Ads before, we saw a big potential in adding the Apple Search Ads to their user acquisition strategy. The study started in November 2018 for 3 weeks with a daily budget of $100 on average. We created a keyword research which was done used for Apple Search Ads ad groups. When the study started, this app was getting about 10,000 impressions a day via organic and social channels. Regarding downloads, the baseline in November was near 4000 monthly downloads (130 average installs a day). 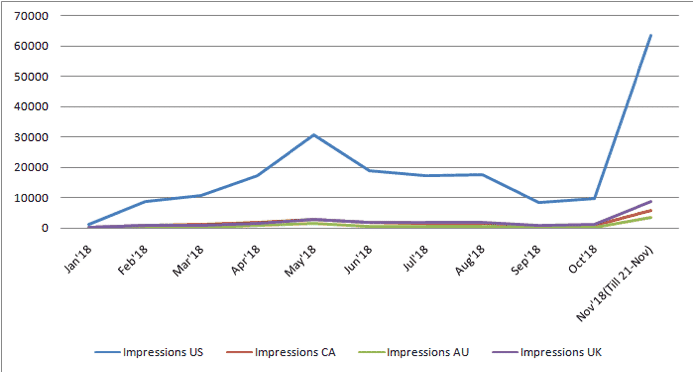 By targeting the right keywords, we were able to increase impressions of the app in the United States to near 65,000. Overall, we saw an increase of 1,561 paid downloads reaching an average CPI of $1.43. However, taking all users into account true blended CPI was not $1.43 but $ 0.93 ($2,200/2,341). We saw an increase of 70-80 daily downloads from media but our total added number of downloads reached an average of 280 a day especially in the first few 10 days. After this rapid growth, the performance stabilized. There was a slight drop in the middle of November. To adjust it, we increased the daily bids for media which improved the performance again. Overall, we were able to deliver an extra 280 – 80 = 200 organic downloads a day. That is an extra 70 downloads increase compared to the performance before, reaching a lift of an almost 50% in organic downloads. Also, remember Apple Search Ads can deliver amazing traffic because the ads are relevant and targeted based on searched queries reaching out to people with high intentions to download apps similar to yours. We have seen this impact of paid Search Ads on organic installs with similar apps that have not been exposed to Apple Search Ads before. By setting up and executing the right strategy, you can achieve similar results in organic downloads. New to Apple Search Ads and want to learn hacks of how to run it efficiently to get the most bang for your buck? Give us a shout: hello@testsite.solidmassmedia.com we are always ready to help. Trust The Network! Get a free evaluation today.